A pair of grandparents who were arrested after visiting family at Fort Drum on July 4 has some wondering if idNYC cards are tipping off federal authorities to undocumented immigrants. Chris Glorioso reports. A Mexican family from Brooklyn says they were headed upstate to Fort Drum to celebrate Independence Day with an Army sergeant family member when border patrol agents questioned their parents' New York City IDs, and then took them to a detention facility hundreds of miles away. Eduardo Silva tells News 4 New York that his parents, Concepcion and Margarito Silva, have lived in New York for two decades. They came to the country undocumented from Mexico but in 2007 they were approved for an official Department of Labor work permit. Eduardo said they had valid New York City IDs, which they'd used to access military bases before, but on July 4, when they came to the gates of Fort Drum, they were stopped by military police. A Mexican family from Brooklyn says they were headed upstate to Fort Drum to celebrate Independence Day with an Army sergeant family member when border patrol agents questioned their parents' New York City IDs, and then took them to a detention facility hundreds of miles away. Chris Glorioso reports. Perla Silva, another daughter of the detained couple, took video showing the part of Fort Drum where her parents were taken into custody. She said in a matter of minutes, Border Protection agents arrived and took her parents to the federal ICE detention center hundreds of miles away in Buffalo. "On July 4, 2018, two people attempted to gain access to Fort Drum without Department of Defense approved identification, which all visitors are required to present. Fort Drum security personnel identified a discrepancy with their passports. This prompted security personnel to contact Customs and Border Patrol." The Silvas were gathering at Fort Drum to celebrate Independence Day with their son-in-law, a sergeant in the 10th Mountain Division who has twice been deployed to Afghanistan. "He's about to be deployed again while my sister is pregnant, and he works so hard for his country, and he loves his country so much," said Perla Silva. Now the Silvas say the Department of Defense won't allow the Army sergeant to speak up in defense of his immigrant relatives. Most worrying is the fact that both parents have recently undergone surgery and need medication. The Silvas say they have gotten calls from their mother, who said she was denied her medication. They say they have not heard from their father. "I know my dad, and he is scared," said Eduardo Silva in tears. A spokesperson for Immigration and Customs Enforcement confirmed it was Border Protection agents that arrested the couple. The incident comes just a month after a pizza deliveryman who'd previously been ordered out of the country was detained as he was delivering food to Brooklyn's Fort Hamilton Army base. The Silvas are not only concerned their parents might be deported; they're concerned about their health while incarcerated. "We don't know what could happen to them in there," said Dulce Silva, another daughter of the detained couple, as she cried. "It would be crazy if they didn't make it out of there." "I don't understand why people pick on people that just want to work and live their life without any troubles," said Eduardo Silva. 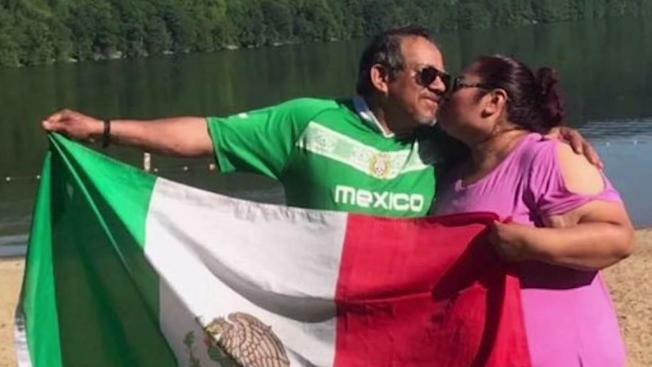 News 4 New York could not immediately confirm whether the Silvas' detained parents do not have a criminal record, or that their mother was actually denied medication. Messages were left with ICE, Border Protection and the Pentagon. The Pentagon asked News 4 to hold the report while they investigate what happened.